Of all the countries in Europe, Britain took in the lowest number of asylum seekers by head of population: less than 0.1% .compared to, for example, Sweden with almost 2% and Austria with 1%. Of the 3,000 lone refugee children from camps in Europe, including Calais, agreed by the Government in response to Dubs proposals, only about 200 children have been admitted. And only about 4000 adults have so far been accepted out of the meagre 20,000 promised in 2016 by the government for over 5 years. In the wake of terror attacks in London and Manchester, Muslims have been even more the target of violence and discrimination. This has affected young Muslim women, in particular, over what they wear. The effect of the government’s anti-radicalisation Prevent programme against terrorism has been to single out Muslims. Recently, the head of an East End school attempted to ban young girls from wearing the hijab – until prevented by pressure from parents, teachers, the community, and local anti-racist activists. But Ofsted has continued to defend the head. Indeed Ofsted’s recent recommendation, vociferously supported by Amanda Spielman, the head and chief inspector of schools, supports inspectors questioning Muslim primary school girls if they are wearing a hijab. There have been newspaper headlines about threats of deportation to a number of elderly Jamaicans who have lived in Britain since children, worked all their adult lives and have families here. These cases has helped to expose the Home Office’s harsh treatment of long-settled, retirement-age UK residents, who are being aggressively pursued over their immigration status. Most were unaware that their papers were not in order until Theresa May’s announcement of a “hostile environment” for immigrants in 2012. Trade unionists have a particular responsibility to fight racism. They form the core of the anti-racist movement. 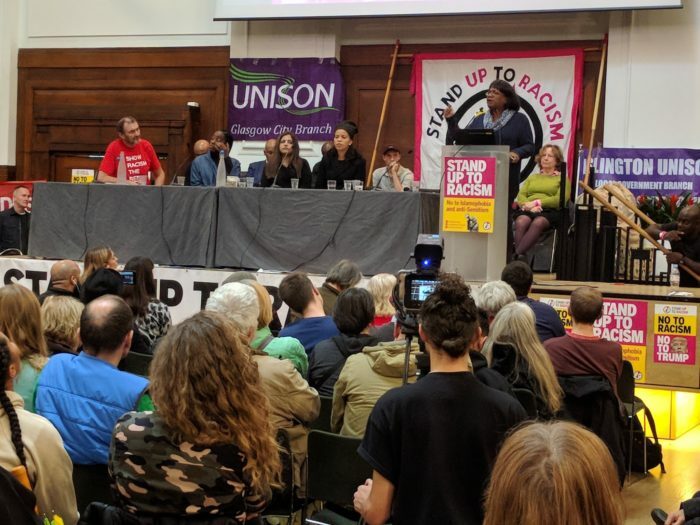 Register for the Stand Up to Racism Trade Union conference on Saturday 10 February, 11am – 4.30pm, Hamilton House, Mabledon Place, London WC1H. This conference has the support of all the major unions in Britain, including Unison, Unite, the CWU, PCS, NEU/NUT – as well as our own union, the UCU. And come to the national demonstration on Saturday 17 March in London, Glasgow and Cardiff. These will be just some of the many demonstrations across Europe and North America on UN anti-racism day.